Whenever possible, I like to try get all of the flavor details on the newest local offerings hitting Utah's craft beer scene. This week, there are two brand-new fruited beers that are very different in flavor and construction. Epic Brainless Passion Fruit: This beer pours a clear, bright straw color that's tinged with rose highlights. After a less-than-agressive pour, the head started with one finger of loosely foamy and rather bubbly white that faded to a ring clinging to the edge of a tulip glass. The aroma has a fresh passion fruit bouquet that intermingles with the spicier aspects of the beer's Belgian yeast strain. The yeast adds notes of clove, which gives it a sweetly medicinal zap as it intermingles with some metallic alcohol. All of this can't manage to stifle the subtle graham cracker bed the malts create at the beer's base. The taste starts bready, light and doughy, with more graham cracker malts. From here, the passion fruit kicks in. The flavors are tart with tropical sweetness, notably, nuances of pineapple, papaya, mango, citrus and guava. Now the base beer takes over. This Belgian-style golden ale is, at its core, a yeast-driven beer. The phenolic yeast flavors are hard to miss, and smack you in the face with spicy notes of clove and coriander. This carries into the finish, which takes on a well-behaved estery booziness. Overall: This is an excellent, fruited 8.8 percent ABV Belgian-style golden ale. Although this is not the typical pairing of fruit and beer, it works because the brewers took care to make sure all of the flavors—from all parts of the beer—don't overshadow the others. If you're looking for fruit-driven beer, this is probably not the one for you. I invite you to get to know this newest edition to Epic's Brainless line of beers. Squatters Chasing Tail Orange Golden Ale: Chasing Tail has been a staple at Squatters for the past 13 years. It started in Squatters' downtown brewpub as a draft-only offering, and soon made it to the bottling line, and is currently enjoyed around the state in cans. This newest incarnation of Chasing Tail is a slightly amped-up version, dialing in at 5.5 percent ABV plus the additional orange flavoring. This American-style golden ale pours a hazy amber color with orange highlights. The head is sudsy and sturdy with impressive staying power. The nose takes you straight to the orange crates of your local supermarket produce section. You get aromas of orange syrup, cascade hops and a hint of pepper. At first sip, orange dominates. It starts off more or less natural-seeming, but starts to taste like an Orange Crush by mid-palate. At this point, some of the hops begin asserting themselves, adding bitterness and a bit of pith to make the orange flavoring seem more natural. All of these aggressive flavors are rounded out in the back end with a bit of biscuit and pine. Overall: There's no question that this is all beer; it doesn't drift into the realm of shandies or malternatives. 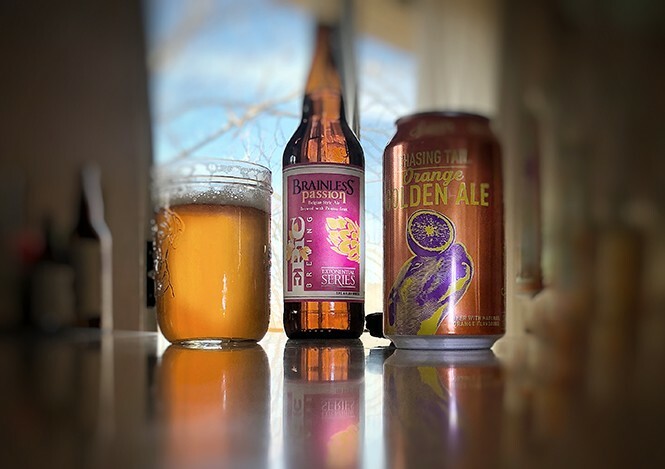 However, like many fruited brews that are popular right now, this one is aimed toward the craft beer newbie, or those who aren't particularly fond of more traditional beers. These are two good examples of beers that are on different ends of the difficulty scale. While they are both fruity and tasty, neither one is guaranteed to appeal to all palates. I've done your homework for you. Now go out, decide and buy. As always, cheers!